When you look around your garden, do you wonder how you ended up with so much stuff? All those decorative items you knew would be just perfect for your garden. You placed some of them in the first open spot you found, while others you left on the porch or patio because you just couldn't decide where to put them. Whatever were you thinking when you bought yet another plastic butterfly on a stick to put in your garden? Hoses, pots, saucers, tools, gloves, pruners. It's as though you left them in the last place you used them because you did leave them in the last place you used them. You know they will last longer if you take better care of them, yet you don't. Then there are the plants. There are plants still in their nursery containers, sitting on the patio begging for a drop of water. How could you love them so much at the garden center but then treat them so poorly once you brought them home? And that's just the condition of the patio. We haven't even walked around the garden yet. We are a bit afraid to, but we must. There we know we'll find weeds, and plants which could use a good pruning back or maybe should even be removed. We'll find areas not yet planted. Vegetables not picked. Flowers which would look beautiful in a vase inside. If this describes your garden, a big cluttered mess, or even a half-cluttered mess, it's time for a good session of decluttering. 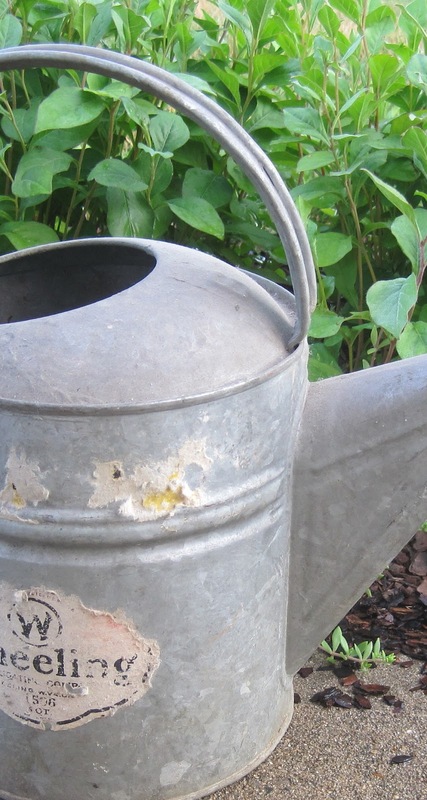 Here are ten ways to do declutter your garden. 1. Make a big pass through each garden area and without thinking too much about it, pull the weeds, cut back spent blooms, removed diseased plants and take out all of the decorative items. Once you are through with one garden area, go on to the next one. 2. Make a list as you go of what you can't do alone in each garden area and hire or ask for help from friends and family to take care of those times. A half dead tree needs to be removed? Call right away to get quotes and get it out of there. 3. Find the open places where you were going to plant all those plants still sitting on the patio in their nursery containers. "Fall is for planting", so plant them now before it gets too late in the season. If you bought annuals in the spring and you haven't planted them by fall, toss them on the compost pile. Then make a donation to a charity of your choice equivalent to the amount you spent on those annuals you never planted. You'll feel better about yourself if you do that. 4. In the vegetable garden, pull out plants which are no longer producing. Compost them unless they are diseased. Throw the diseased plants in the trash. Consider planting a cover crop on the fallow beds to prevent weeds and enrich the soil. 5. Go through your garden tools. Toss those that are broken. Do you still have too many tools? Keep those you use the most and donate the rest. (Unless you have a hoe collection. For now, you can keep your hoe collection). Then take those you are keeping and clean them up and store them properly when not in use. 6. Take a look at all those garden decorations. Toss them out if they are broken, donate them if you don't love them. Clean and put them back if you think they add to your garden. Remember nothing damages garden decor faster than winter, so if it is fall, put all those decorative items away for the winter. If there are too many decorative items to store each winter, go back through them and donate what you can't take care off properly. 7. Go through all your pots, containers, saucers, etc. Recycle plastic nursery pots or find a garden center willing to take them back. Go through pots and saucers. Sort by size and get rid of any you haven't used in the last year. Get rid of what is broken unless you are one of those crafty-type people who can make something of broken pots. If you actually think you are one of those crafty-type people but it's been a year or longer and you've done nothing with your broken pots, get rid of them. 8. Hoses? A necessity of gardening but oh how we fight them all summer. They kink, they leak, they balk at us. Buy a good hose reel and keep your hose at least rolled up when not in use. If it leaks, replace it. If it kinks, replace it. If it balks, well, that's what hoses do. 9. Round up all the garden gloves. If you can't find the mate to a glove, toss the glove. The mate will surely show up, then toss it, too. Get rid of gloves that don't fit properly or are full of holes and then find a good home for the remaining gloves and vow to return your gloves to their home after every use. 10. Finally, after you've done all these steps, go back through those garden beds again. Weeds grow, flowers bloom and die and so it is never once and done in a garden. A garden is a living, breathing, every changing place so it will always need some attention. And aren't you glad of that? That attention is called "gardening". Give your garden regular attention and like a room that is cleaned regularly, it should never become too big of a mess. Honestly, every gardener needs to do a bit of decluttering this time of year. I do. You do. We all do. Go. Do it now. Let us know how it turned out for you. Uncanny! It's like you were looking at my garden while you were writing this! I love this post. Great ideaas. I laughed when I read #3. We all have those collections that can't be tossed. tee hee.. Thanks Carol. I've been thinking of doing this very thing and you have got the approach all organized for me. It has been depressing trying to garden here in August in the midle of the drought but this is one thing we can do to prepare for better times. I suspect your garden fairies have had a trip over here and had a peek in my garden! Great advice and wonder just how many of us need to do exactly as you suggest. Yikes! Your crystal ball is working well because you saw my garden, didn't you? Your advice is perfect. What I usually do is get disgusted with the clutter and overgrown plants, go inside and close the door. Nothing improves but winter takes care of a lot and by spring most of the ornaments and misplaced pots are broken, the plants on the patio, still in their nursery containers are good and dead, and my rusty tool collection has increased. Maybe I should follow your advice instead! Great post, I so need all that advice! And I need hurry up to plant those plants that have been in the nursery pot since long time ago, before winter gets here. How well you know fellow gardeners! I struggle with cutting bad dead growth or leaving the seeds for the birds andas far as garden ornaments go.....let's not talk about that! I was thinking about doing all that, Carol, until I took a peek at the forecast. 38 degrees overnight next week. I have just days to start moving in the tropicals and succulents. Maybe I'll declutter next spring!